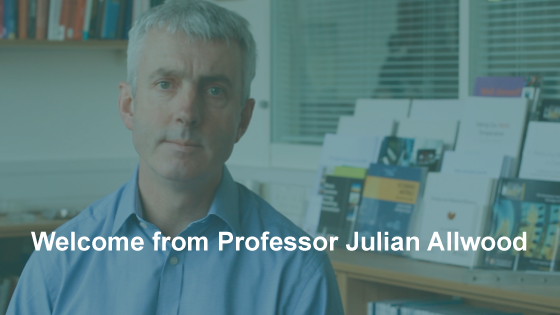 The Use Less Group is based in the Department of Engineering at the University of Cambridge and is led by Julian Allwood, Professor of Engineering and the Environment and Fellow of the Royal Society of Engineering. The group is pursuing world leading research into the sustainable use of materials, energy and resources. Climate change is real and it's happening now. Burning fossil fuels, coal, gas and oil releases CO2 into the atmosphere and increases the strength of the greenhouse effect. Conventional economics dominate the production and use of the key bulk materials – steel, cement, plastic, paper and aluminium. These energy intensive materials are produced in tremendous volumes – the mass of steel produced globally each year is three times greater than the mass of the world population and for every single one of the world's population, we are producing 200kg of steel every year. As a result, in the UK, materials are significantly cheaper than the cost of human resources. For examples, one tonne of steel costs around the same as one day of a design engineer’s time. Thus, we tend to use far more material than necessary to produce final goods – where possible, we use extra material if it can save labour. For example, we have good evidence that half of all the sheet metal made each year globally is scrapped along the supply chain of production. We are committed to innovating and implementing a reduction in material demand through mapping global flow, influencing policy, and inventing novel technological solutions to reduce industrial carbon emissions. We present an optimistic, entertaining and richly informed evaluation of the sustainable management of our growing demand for materials. Straightforward and accessible, our reports are ideal for use by policy makers, industry and the media as well academic readers. We are increasingly using video to create a living record of our work and we aim to build up a library showing our exciting and innovative projects. We publish papers across our projects, with topics ranging from novel metal forming processes through strategies for material reuse to mapping energy flows.